This post is sponsored by Marshalls, but all opinions are my own. Thank you for supporting the brands that make this blog possible! Well helllllllo and happy Monday! Ok, so I know what I’m about to say probably doesn’t seem possible, but we are officially one week out from the 4th of July. Well, one week and two days if you want to get technical about it. Seriously, how is that even possible?! This month has gone so darn fast and it’s all been a bit of a blur to be honest. But things are finally slowing down around here and I’m excited to start enjoying the lazy days of summer with my little crew. 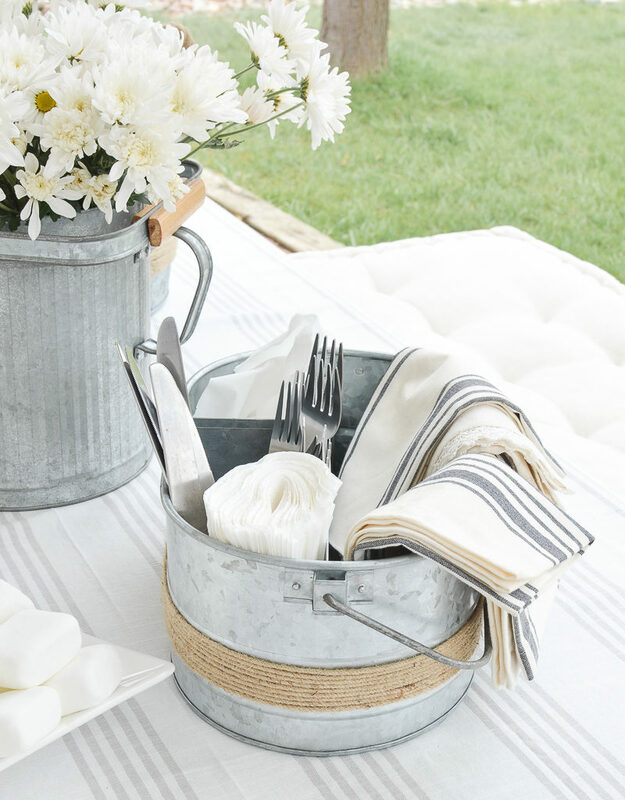 Our favorite thing to do this time of year is to be outside as much as possible, so today I want to share my must-have items for easy outdoor entertaining. 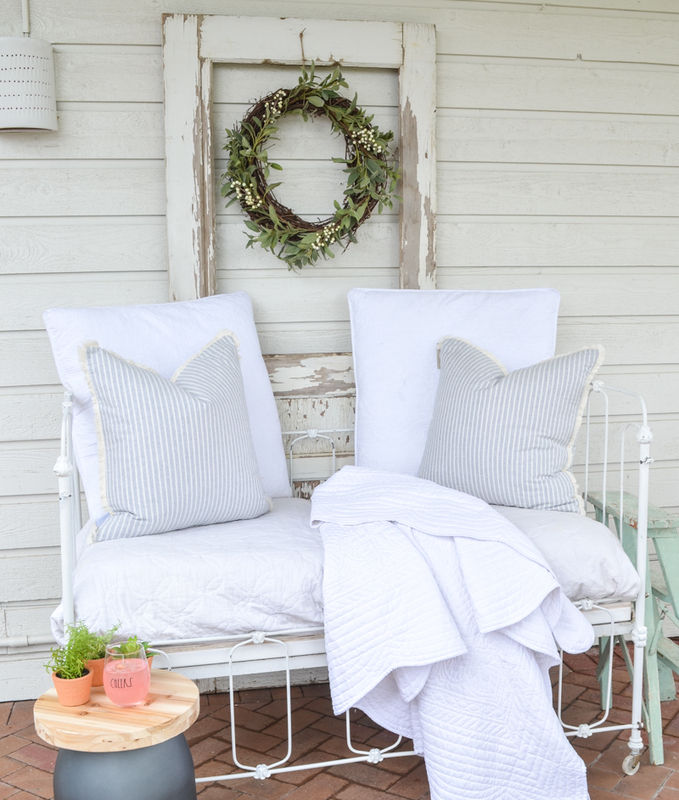 These are little things I do to add a bit of charm, comfort and ease to our summer gatherings. I also made a trip to Marshalls, which you guys know is one of my FAVORITE places to shop, and I found a ton of great things for a 4th of July inspired celebration! All right, first up you gotta have cozy seating. 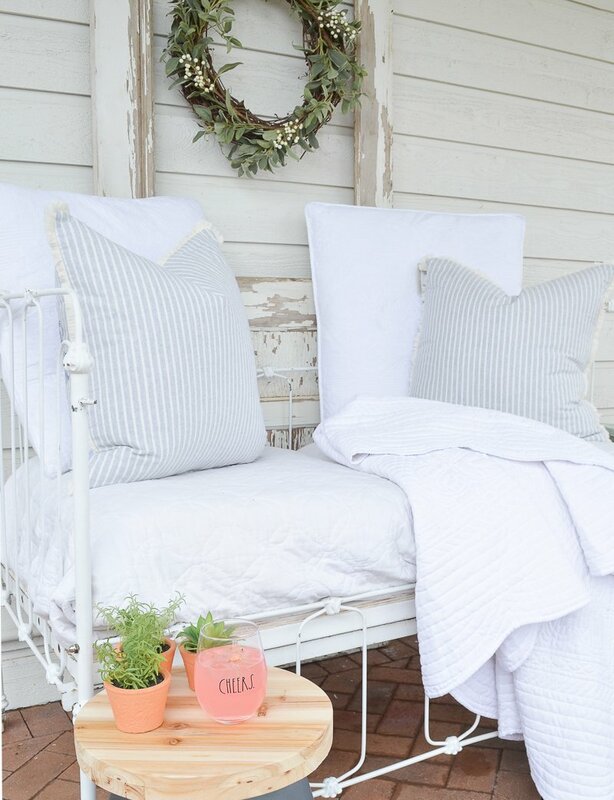 You guys know I have an obsession with throw pillows, so it probably doesn’t surprise you that they’re one of my must-have items for outdoor parties. 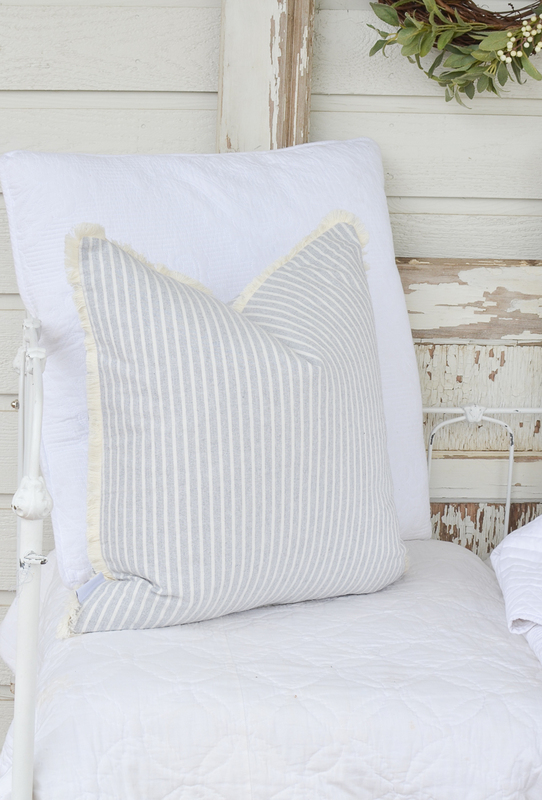 I like to pile up comfy throw pillows and cushions in order to create the most inviting atmosphere possible. Call me crazy, but I basically want to create a living room on my back patio. 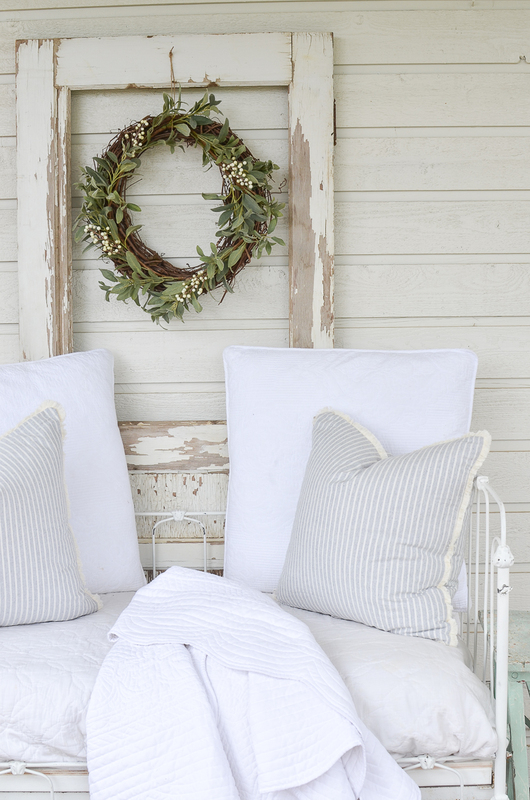 Our vintage crib makes the perfect cozy couch for lounging on a warm summer night. And I picked up these summer-y light blue throw pillows at Marshalls to add a bit more comfy-ness to this spot. They are down-filled and I LOOOOOVE them. Wanna know a crazy pet-peeve of mine? Parties without music. I know it probably sounds ridiculous, but I can’t stand a quiet party. I absolutely must have music playing in the background of any party I’m hosting. It doesn’t have to be loud, but just soft music totally sets the mood. Plus, I think it helps people feel more relaxed and comfortable, which means they’re going to have more fun. ALL GOOD THINGS. Any outdoor celebration needs lots and lots of food. I mean, that’s the best part if you ask me. I only show up to parties with good food. Just kidding. Kind of. But, I like keeping it pretty easy for outdoor summer parties–nothing too heavy or complicated unless I feel like getting fancy. If we’re having a dinner party I try to prepare everything ahead of time so I’m not busy cooking instead of enjoying the party. Plus I usually do lots of fresh fruit and simple grab-and-go snacks for the kids. 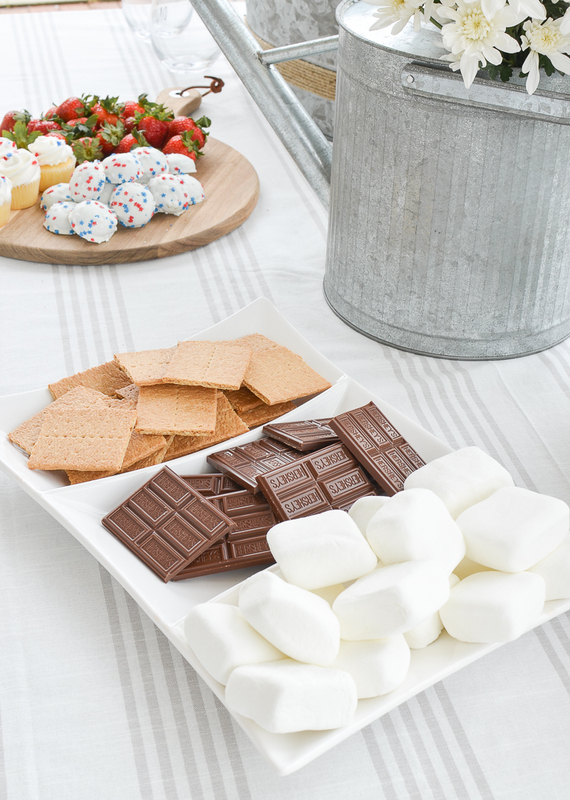 And you can’t go wrong with a good old fashioned s’more tray on the 4th of July. 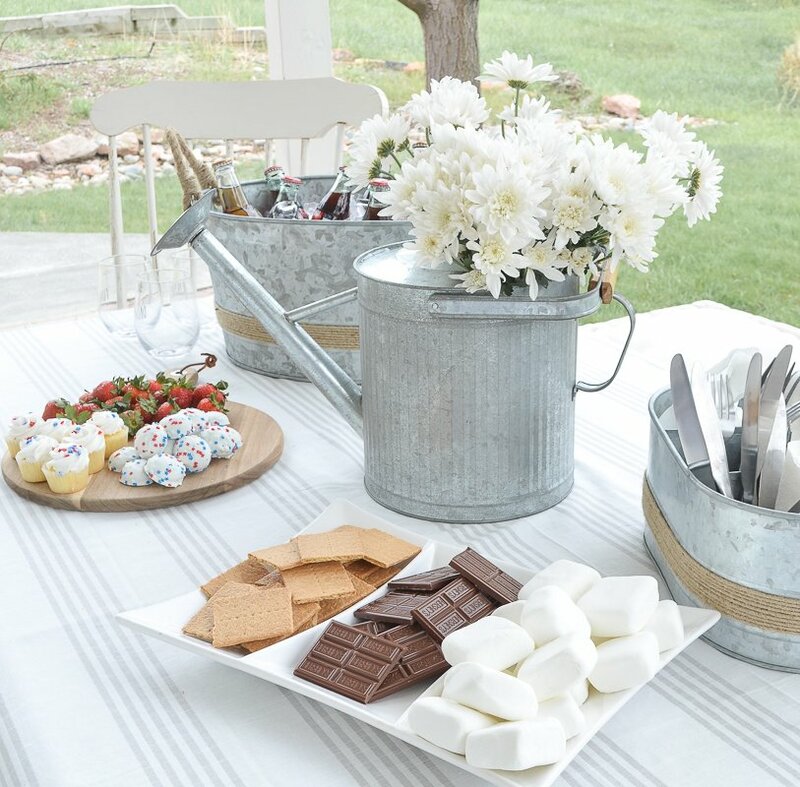 Marshalls has tons of platters, serving trays, cake stands, and just about anything you could want for an outdoor party. 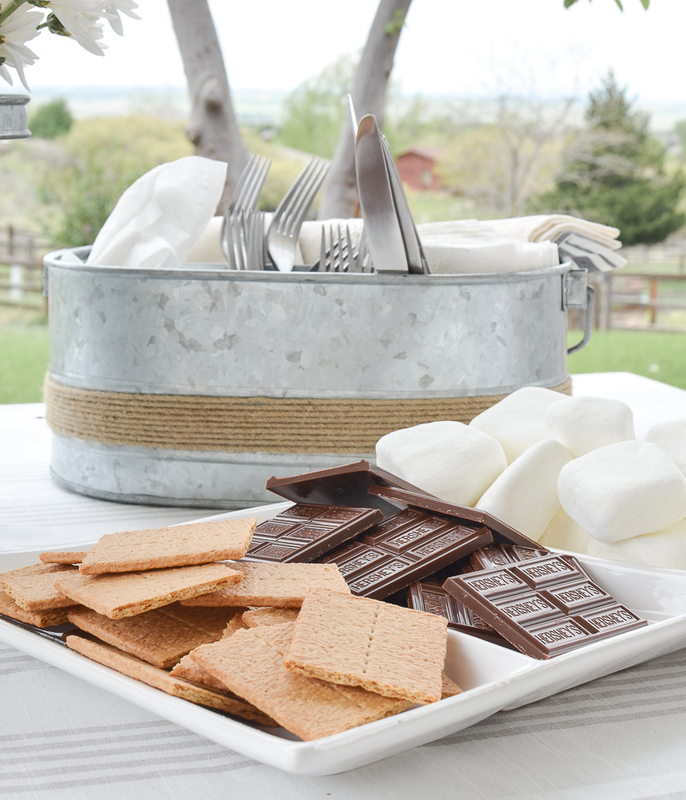 I picked up this large white platter there and it’s perfect for all our s’more goodies. This would also work really well for fruit, chips and dip, cookies, etc. 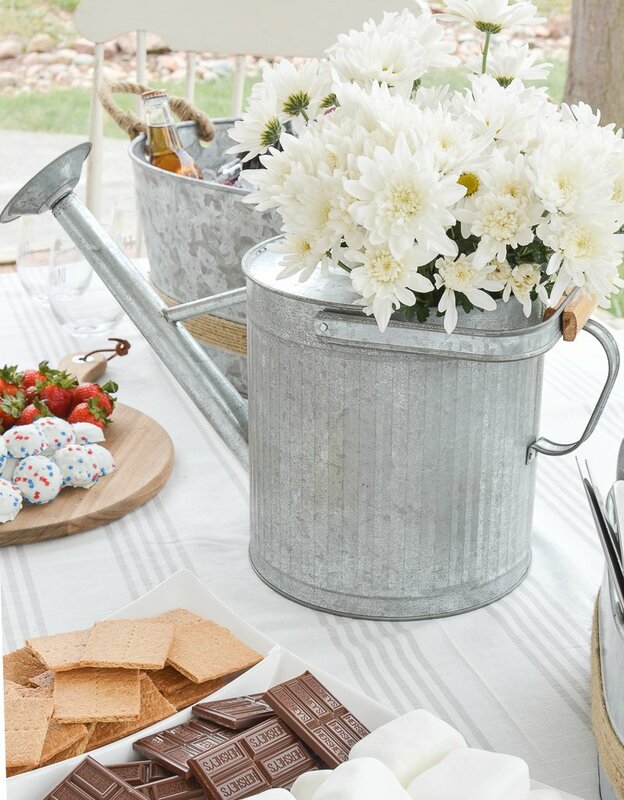 I also found everything I used to make this simple tablescape at Marshalls too–including the galvanized bucket for drinks, the utensil caddy, and even the watering can. 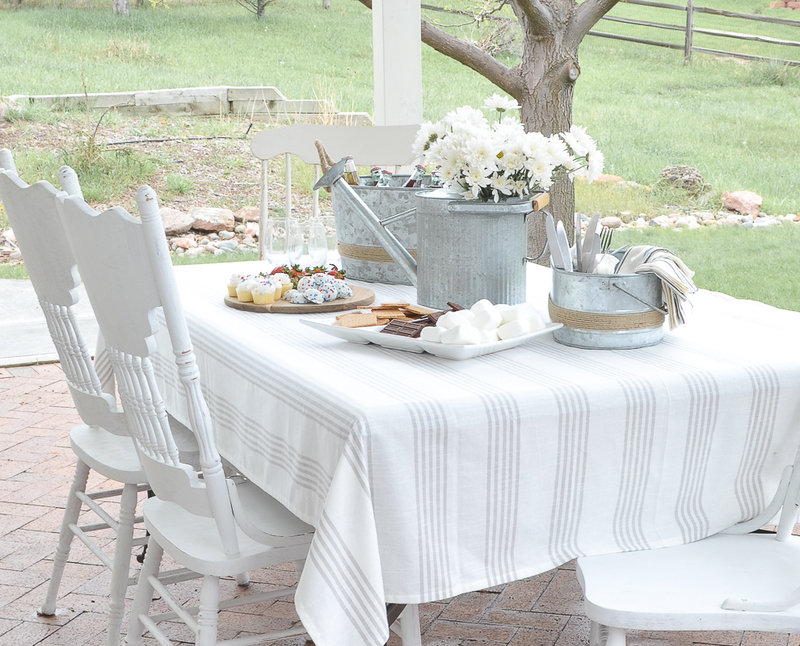 I love the farmhouse-y vibe they give this table for summer. Plus they’re great quality. And here’s a little tip for your next outdoor s’mores party–leave a pack of hand wipes in your silverware caddy for easy cleanup! 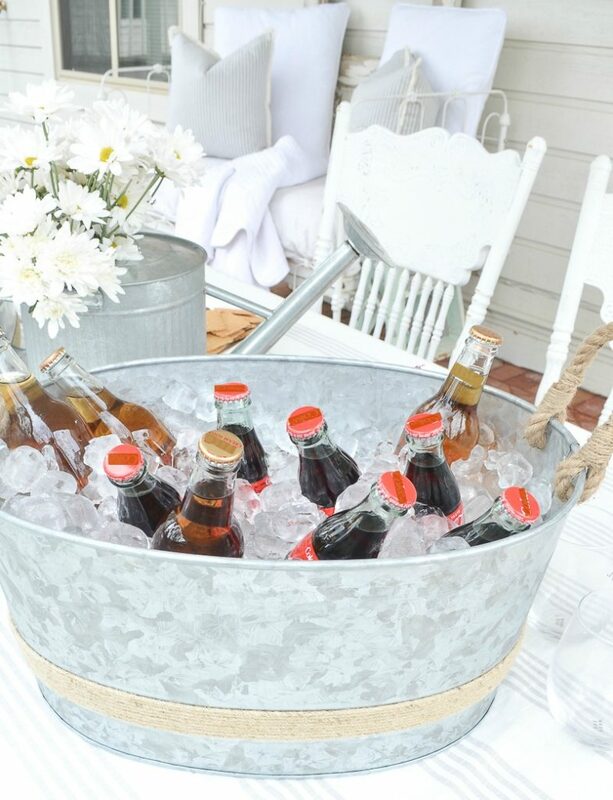 There’s just something about an outdoor summer party that makes me want to splurge on fun drinks in cute little bottles. Give me alllll the fruity, colorful beverages. I usually make a few big pitchers of something easy like lemonade with fresh fruit. And my kids having been loving the old-school soda bottles this summer, so that’s what we’ve been doing lately. Plus they make a fun little centerpiece when you put them in a big bucket of ice. Gotta keep those babies ice cold! I love it all, but square marshmallows? Where did you find those? They’re made specifically for s’mores. Kinda fun! Got them at Target. I actually saw them at Wal Mart just a little while ago. They are new to me, but a great idea. Yep! Those are the ones! Oh it washes up easily! 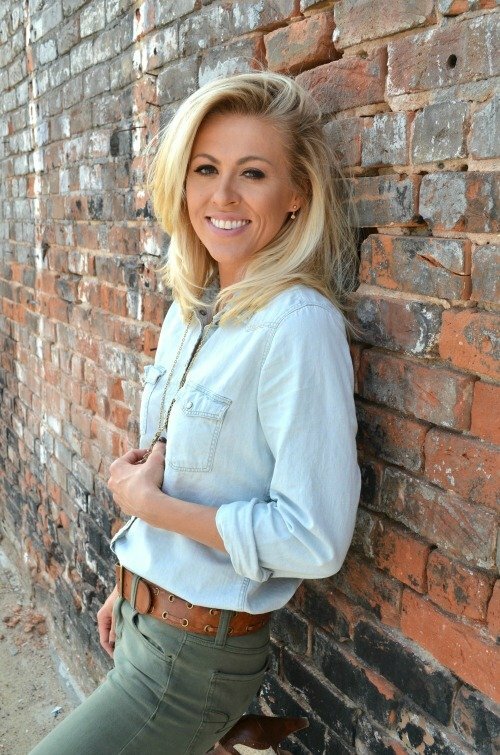 Sarah we love your blog. Looks so pretty and cozy! Love how creative you are! So much inspiration here. Will definitely have to use some of these ideas. And the square marshmallows! Yum! I love that cheers cup! Is that from Marshall’s too? Yes those are! They came in a set of 4.
haha ready when you are Angela!! I just bought an old crib similar to yours. I am going to have a cushion made for it. I looked up an old post and you said you used cushions off of an old couch. My daughter just gave a couch away 2 days before I just know that those would have worked. Oh well. I’ll have to measure for you, but I’d say they’re about 2 feet deep–maybe 2 and a half! thanks so much Dianne! It was a fun post to do. Love your style. New to your blog – simply lovely.